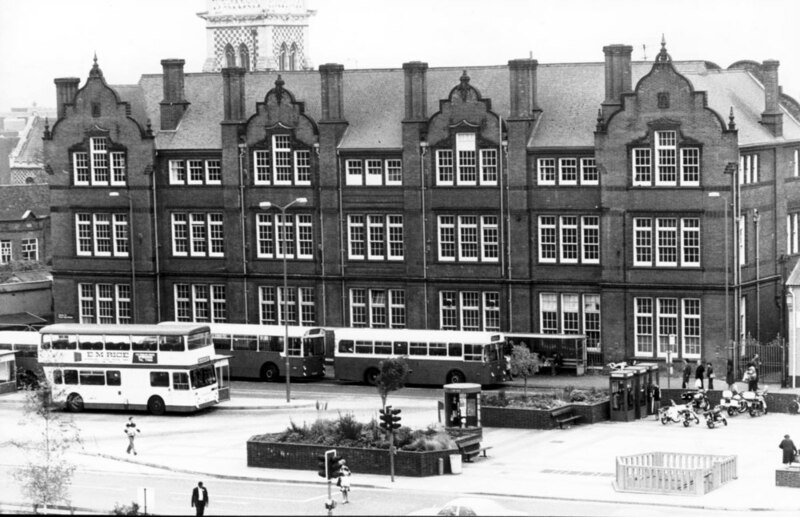 Tower Ramparts School stood in the centre of Ipswich, until it was demolished in 1979 and the Tower Ramparts Shopping Centre was built on the site. It seems to have left its mark in more than one way! Until the late 1960s pupils often received harsh punishment for alleged incidents and there was no defence. There was also bullying from older pupils with punishment in the school “stocks” the iron railings in the playground. It was the way of life at the time at many secondary schools and many have fond memories of their school days there. George Potter remembers the day teacher “Spud” Baker punished him for breaking a window. George said. “I was there until 1949. Mr Heath was the head master; his wife was also a teacher. My class door used to open out into the main hall where we had assembly. One of my teachers was Mr Groom. He came to school on an upright woman's bike with a basket on the front of the handle bars”. Teacher “Spud” Baker, I remember well, as he gave me six whacks across the palm of my right hand after I put my left hand through the glass window of the door to the handicraft room, which was then in the playground. We used to play touch with a boot by throwing it at each other. I cut my wrist very badly by putting my hand through the glass window of the door trying to catch the boot. I was rushed to the clinic, then in Elm Street. Two days after I returned to school. “Spud” gave me the six whacks with his cane across the palm for breaking the window. No sympathy for my cut wrist”! Barry Anderson, who lives Las Vegas. USA had a keen eye for some of the teacher’s cars, he said. I started in Mr Finbow's Form 1.1 in 1959, was in Mr Rose's 2.1 and 3.1 and ended up in Mr J Woods' 4.1 in 1962. I did well on the eleven plus exam, but because my father was a lorry driver the headmaster at the Chantry Annex thought I'd be better off at Tower Ramparts, talk about class distinction”! “As it turned out, I got a good education at Tower Ramparts. Mr Webber was the man behind many changes and he did a world of good. Mine was the last class of all boys, and in 1962 the third years were amalgamated with Christchurch Girls, but the 4th years were not mixed”. “ Mr Webber instituted a house system, with Tudor (Red), Norman (Blue), Stuart (Yellow) and Saxon (Green), and the possibility of earning merit cards for your house. It was a proud day for me when I earned my first merit card for Tudor House from Mr Finbow, one of the kindest teachers I had ever met. He drove a yellow and green roadster, probably a MG-TD. Mr Wood had an Austin Princess, it looked like a limousine to my untutored eye, but it sparked my interest in cars, especially when Botwood's Garage opposite had an E-Type Jag in their window. I promised myself a Jaguar then and there, but it wasn't until I was commissioned into the US Air Force in 1978 that I could afford a used '74 XJ-6 and that was a disappointment, it couldn't handle the hot weather in Texas and Alabama”! “Mr Rose had a bike, so obviously teaching maths wasn't the most lucrative of careers. I do remember several careers oriented trips, one took us to St Audrey's Mental Hospital, and I didn't fancy that” A highlight was the 1960 school trip to Austria. I think there were about sixty of us on the trip spread around three guesthouses in Radfeld near Rattenberg. I clearly remember a chap, Peter Pegg keeping us up half the night brushing his teeth. He's probably a dentist now! “I emigrated to the USA over forty years ago, but got stationed at RAF Lakenheath and RAF Alconbury twice in my 20 year USAF career. It was strange to be in a shopping centre in 1994 where my old school had been. Michael Green added “My recollection of life at Tower Ramparts is certainly of teachers delivering brutal punishment using canes, slippers, fists and frequent bombardment with chalk and blackboard dusters. “One teacher owned a cane which he had carefully split into four thin sections, then re-bound together with tape; each lash would bite deep into the skin. I can recall our own victories though, such as the bucket of water perched above a nearly closed door offering the incoming teacher an early bath”. Mr B Sharpe of Ipswich can also recall the swish of the cane. said “I attended the school from 1947 to 1951. Mr Heath, the headmaster, gave me the cane – one stroke on each hand, I had no idea of what offence I had committed”! “Some of the teachers that I remember are: Mr V E Finbow. He challenged us to guess what the second initials of his name stood for. He was very much a gentleman. Some others were metalwork teachers Mr Dyer and Mr Foley; woodwork teacher Mr Robertson also science master Mr Wilkinson; Mr Gosling, Mr Freeman and Mr Lee. “Another teacher that sticks in my mind is Mr Markham, who maintained a complete disciplined silence in his class. He had a fearful reputation. No one felt inclined to take a chance”! “Our music master was Bates Wilkinson. I also remember Mr Garlic in that capacity. Looking back, I don’t see the school as a complete source of terror. About the worst thing that happened to me was receiving a school dinner with ants crawling on the salad. I took it back and exchanged it: more ants”! “All in all, happy times. Secondary modern education was not highly regarded then but at least the vast majority of us ended our school days there with the ability to read and write, and with some idea of respect for our fellow citizens”. Eric Brown of Rushmere St Andrew remembers “Spud” Bakers special double barrel cane. Eric explains. “Tower Ramparts was during ‘our time’ a school for boys and later to be a mixed secondary. Mr Webber the Headmaster insisted that both jackets with school badges and school ties be worn. This never proved 100 per cent as many parents simply could not afford the extra expense. One of the highlights of the school was the introduction of a new gym converted from the old boiler room on the ground floor. We were always envious of other schools like Westbourne who had their own playing fields. For us it was a trek for a shared field off the Valley Road. Discipline was at the forefront and the cane was freely given. We had one teacher, ‘Spud Baker’, who treated this little treat as a craft. For the more serious offences he would remove from his locker his special double barrel. This cane was so tuned that in one brief stroke it would hit your hand and with the recoil you would receive a second before you could even blink. On reflection it never did us any real harm and if anything, taught us a little respect. Travel to and from school was either by bus, foot or bike. To me, and I am sure many old pupils of the school, a passing glance at the Tower Ramparts Shopping Centre will always be to them Tower Ramparts School”. Dawn Worlledge of Ipswich has memories of corporal punishment at Tower Ramparts. “I too was a pupil there and Mr Cadwallader was my Headmaster. I also have fond memories of the school. I went to Bolton Lane too. I had the cane across my hand and can still feel it. Many of us “bunked off” a lesson and went to the park instead and got found out. It did me no harm, in fact I never did it again as a result of the cane. I left around 1970. When you could leave at fifteen and have worked ever since, except when I married and had my own children.